"Paul Garrison is tired. The man of the sea, with a permanent squint from scanning a thousand horizons, is tired of the games, the disguises, the elaborate cover stories. He's through with deceiving friends, colleagues, and clients. After years in the shadows, he is throwing off his mask and revealing his true identity. See Justin Scott on Collaborating with Clive Cussler. Video courtesy Hudson West. 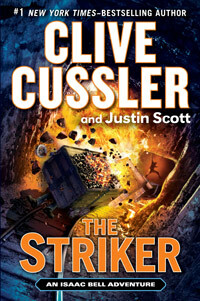 "...The Striker: an Isaac Bell Adventure" (Putnam), by Clive Cussler and Justin Scott. The sixth adventure featuring early 20th-century detective Isaac Bell might be the best yet in the series by Clive Cussler and Justin Scott. "The Striker" focuses on Bell's first big case at the Van Dorn Detective Agency. It's 1902, and one of the big issues at the time involves corporations trying to squash labor unions.